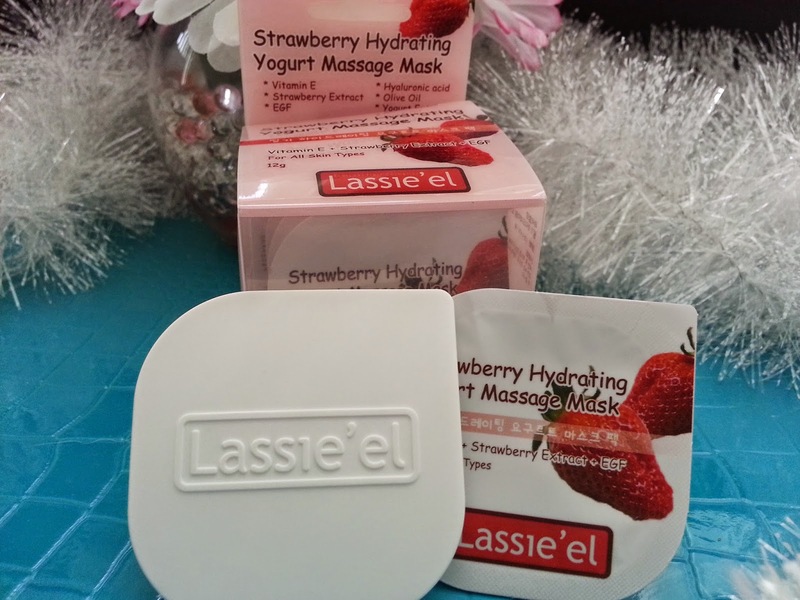 I am back with another review for one of Lassie'el's Yogurt Massage Mask and this time it's the Strawberry Hydrating Yogurt Massage Mask. I purchased all five of Lassie'el Yogurt Massage Masks when they were on sale from Wishtrend. At the time, I couldn't decide on which mask I wanted to try, so since they were on sale, I thought I might as well just buy them all so I can try them all. I've already tried their Aloe Soothing Yogurt Massage Mask and despite it not smelling like aloe (not that I mind), I ended up loving them. When I finished my aloe soothing massage masks, I stared using these strawberry hydrating ones and needless to say, I like them, although not as much as the aloe soothing ones. Read on to see why I like these! Product Description: A highly nourishing wash-off massage mask that delivers rich yogurt nutrients and various plant and fruit extracts to the skin. It focuses on hydrating the skin, regenerating it and providing the skin with vitality. The Strawberry Hydrating massage mask converts dull looking skin into younger-looking skin with clarity and vitality. The highly concentrated yogurt extracts in this wash-off mask will gently exfoliate your skin and melt away any impurities to cleanse out your pores and leave you skin brighter than before. Use after the double cleanse process, tone your skin and apply the wash-off mask evenly onto the face, avoiding eyes and lips areas. Massage gently to dissolve the beads. Rinse off with lukewarm water after 5 - 10 minutes. Did you know strawberries are richer in vitamins than lemon and contain 10 times greater vitamin C than apples for anti-oxidation and protection from various diseases. I naturally love strawberries and not for the reason that I just mentioned above, but, it's great to know that a fruit I love a lot has so many great benefits. 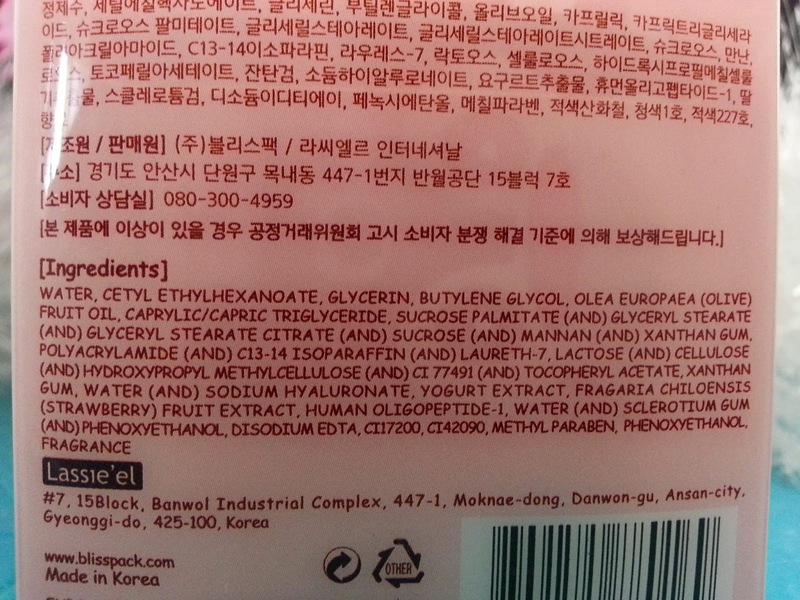 This massage mask contains some amazing active ingredients such as lactobacillus, strawberry water, and EGF. 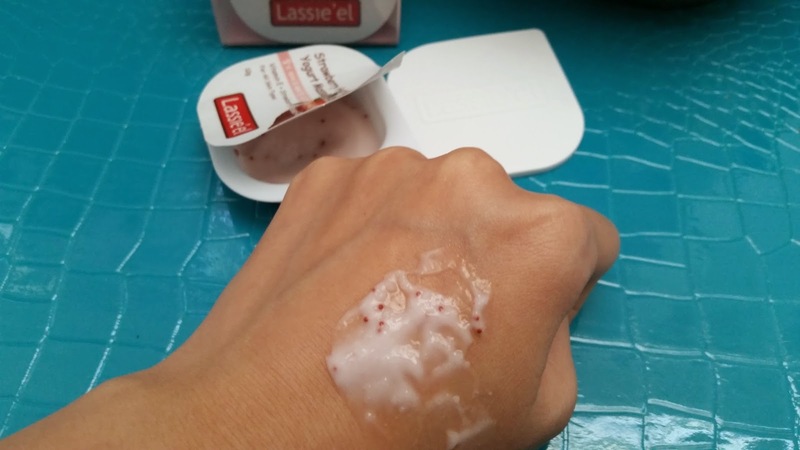 Lactobacillus works to brighten the skin and it's always on duty for wrinkle control. Strawberry water works to hydrate the skin, keep wrinkles at bay, and reduce inflammation. Lastly, EGF works to regenerated skin cells, provide elasticity, and wrinkle control. My Thoughts: If I could sum up my feelings about this product in 3 words it would be: I like it! These wash off masks are worth more than its $3.60 price (although it was on sale). Plus it comes with a lid that I can use to keep these masks fresh (I also use them to keep my Innisfree Capsule Recipe packs fresh as well). Each mask pack is good for 3 to 4 uses, so this entire package of 4 packs can last up to 16+ uses. I generally follow the product's instructions on how to use it. Thus, I leave the wash off mask on for 5 to 10 minutes before I wash it off. Although, I once left it on for 15 minutes (by accident) and luckily, it did not irritate my skin. The instructions say to use a toner before this mask, I find that it doesn't change how well the mask works if I don't use a toner, so I generally don't. Please note that like most wash off masks or sleeping packs in small packages like this one, it is recommended to store them in the fridge. However, for me, putting my beauty stuff with my food just isn't ideal and I haven't bought a cosmetic fridge (or mini fridge) for that yet either. So for now, I've just been keep them in a dry and cool place. I know cosmetic fridges are a big trend in Asia but I just can't decide if I want one or not. Is it worth it? If you use a cosmetic fridge or know more about it, please let me know! 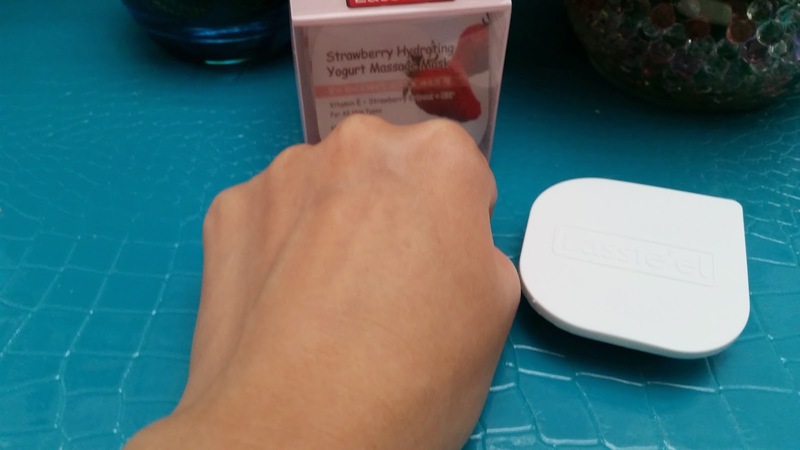 Here's what the strawberry hydrating yogurt massage mask looks like in its packaging. It's got a pink cream color with small red beads. 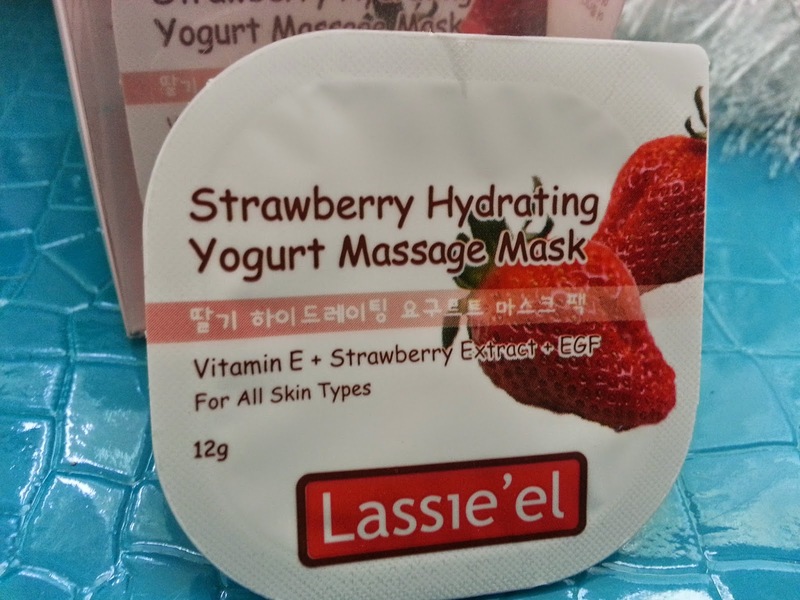 The texture of this mask is creamy and yogurt like, it really looks like strawberry yogurt~! Do you give up? Would you like a hint? Here's the hint: it smells like ________ with the faintest strawberry scent, what could that ________ be? 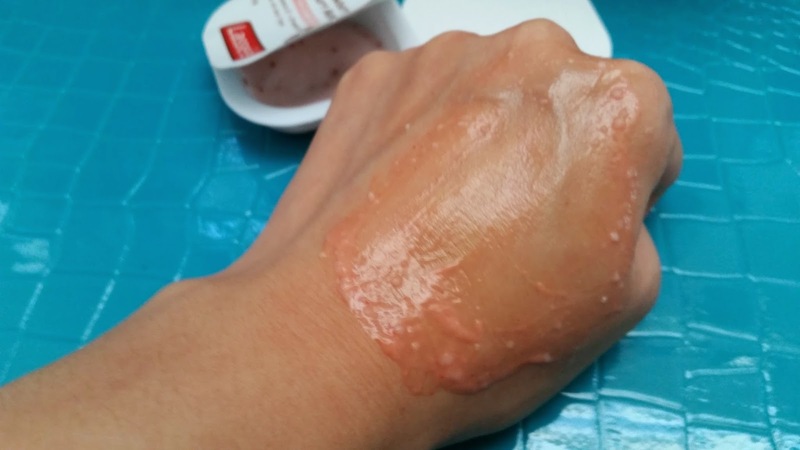 If you read my Aloe Soothing Yogurt Massage Mask post, you might already have an idea. If not, I'll give you a few more minutes to guess. Okay, times up! The word for the blank is grapes! Yes, I said Grapes, what an odd pair huh? The grape scent really over power the strawberry scent and it wasn't until nearing the end of my 10 minutes, did I notice the faint strawberry scent. Although I was okay with the aloe soothing smelling like grapes and not aloe (because strong aloe scents can sometimes be a turnoff), this strawberry one should not smell like grapes. I am disappointed. I was really hoping for a sweet strawberry yogurt scent, instead it was grapes. Ugh. Now I am kind of curious on whether the other 3 yogurt massage masks will smell like grapes too. I will be reviewing them soon! I have to say, the scent of this product is a no-no in my opinion. I don't mind the smell of grapes, I just wish it smells like strawberries instead, since you know, it's a strawberry massage mask. I generally like to use a spatula for these products to keep it as sterilized and clean as possible. Most of my spatulas are from other creams and sleeping masks, although you can purchase these online or at Daiso. The ones from Daiso comes with cosmetic containers as well for only $1.50, so if you have a store near you, you should definitely check it out! By the way, totally off topic but have I ever mentioned how amazing the Daiso is? I can find like a lot of things for $1.50 and they are all useful. Seriously, it's like a premium dollar store. It's got everything and I seriously mean everything. I've even bought Momo's dog collar and toys there and he loves them. They don't have an online shop yet (only an online bulk store) but maybe they will in the future. Maybe I'll do a Daiso haul/post in the future, let me know if anyone is interested in that! Okay, back to the product on hand, let's talk about its texture. 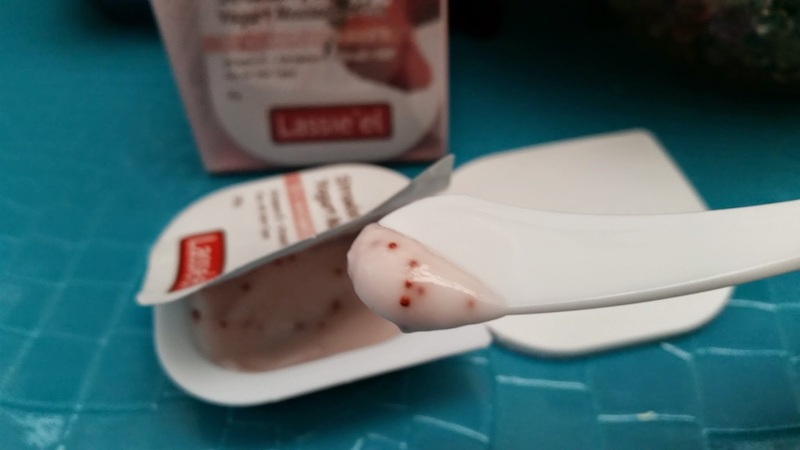 It's creamy and yogurt like with plenty of little red beads. You can see in the picture above that the light pink creamy yogurt masks is a bit lumpy, don't worry, that is normal. Once you massage the mask, the lump and red beads will melt and blend right in with the mask. I like to massage the mask for a good minute or two then leave it to sit on my face for another 8 to 9 minutes before washing off. Most of the time, when I am using this mask I'll be doing my hair treatment, which is a 5 minutes deep conditioner. This way I won't have to worry about being bored for 8 minutes while waiting to wash the mask off. Although the aloe massage masks came pretty full in its containers, these were actually 3/4 full. I wonder if it's got to do with product safety and what not. However, I am not complaining because each pack can still be used multiple times. Totally worth it. Here's what the mask looks like once the red beads are blended in. As you can see, the light pink colored creamy mask turned a bit more red and there are no more small red beads to be seen. I find that unlike the aloe soothing massage mask, the white lumps in this yogurt massage mask doesn't completely blend in. Here, I've massaged the back of my hand for a good minute and you can still see some small lumps. It doesn't seem to be a big issue or anything, but I thought I'd mention it just in case. I left the mask on my hand for 10 minutes and as you can see in the picture below, the right side of my hand where the mask was applied to looks a bit brighter and lighter than the left. The mask is not drying at all and doesn't feel like it is striping the skin of any of its essential oils, which is great. I love that it doesn't feel drying on my face and it's not irritating to my sensitive skin either. I wish that the brightening effect is long lasting, this is the other con for this product. Although it does provide brightening effects right after you've washed off the mask, this effect does not last. So, if you are looking for a product that will provide long lasting whitening effects, this product won't be the one. Final Thoughts: Although I have a soft spot for strawberries and its related products, I just can't bring myself to love this massage mask. I still like it, just not love. It lost a heart for 2 reasons, but the one I am most disappointed in is that fact that it just doesn't really smell like strawberries. I mean come on! A strawberry mask that doesn't smell like strawberries? What is this sorcery? It throws me off every time I use it because I still hope that it will some how smell like strawberries, even though it always ends up being grapes. Whoever made this line must have really liked grapes or something. *So I made the update in red regarding the scent of this mask somewhere in the middle of this post. I still stand by the idea that it smells like grapes sometimes, however, I can pick up the strawberry scent a lot better now. It seems that because the strawberry scent is so fake, it can be mistaken as grapes or something not strawberry-like (isn't that odd?). I still don't like the scent of this mask though. * The other reason why it lost a heart is because the brightening effect does not last long. I have tried a lot of masks that claims it has brightening effects. Although most don't last long either, it still lasts longer than this masks. In case you are wondering, the brightening effect for this Strawberry Hydrating Yogurt Massage Mask last about 2 to 3 hours tops. Still, I like this wash off mask because it does a wonderful job exfoliating my skin with out striping it. It doesn't feel dry or tight after using and it does not irritate my sensitive skin. Plus it is extremely affordable! 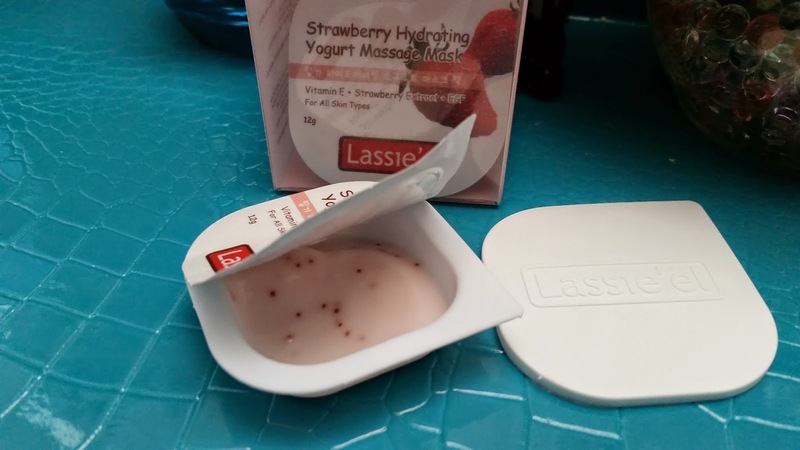 I'm not sure if I would purchase this strawberry hydrating one again, although I know I want to buy more of those Aloe Soothing yogurt massage masks in the future! 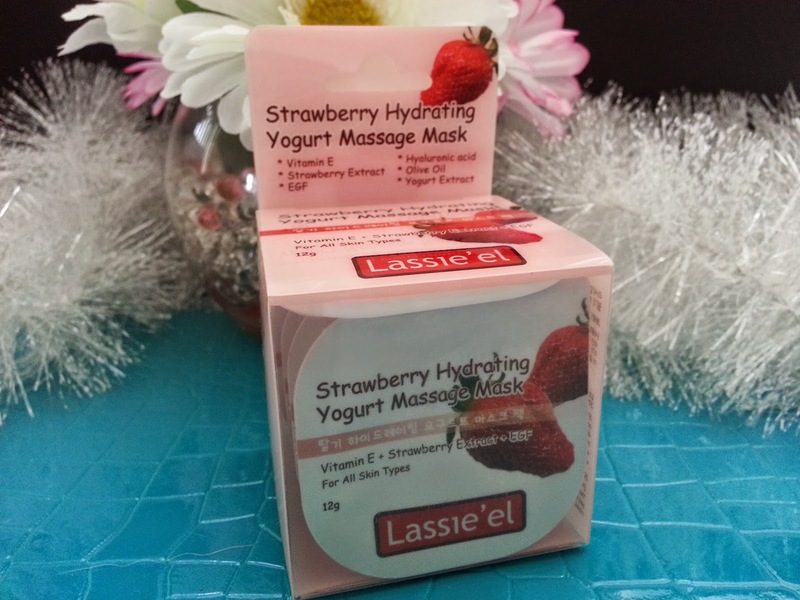 Have you tried any of Lassie'el Yogurt Massage Masks? If so, what are your thoughts on them? If not, would you like to try them? Which ones do you have? I don't think all of Lassie'el's masks smell like grapes, maybe it's just the 2 that I've tried so far lol. Now I'm tempted to go and open up the other 3 just to see what they smell like. It's such a small thing, but I love that these come with a lid. Anyway, regarding cosmetics fridges - I don't have one, but if you're feeling grossed out by the idea of tossing in your beauty products with all your food, I recommend getting a big Tupperware container and keeping your beauty stuff in there inside the fridge. That way they won't get leftover food smell, lol.